It’s not that a night spent in the bush of the Serengeti is any longer than a typical night somewhere else — but when your tent is sandwiched between the Maasai village cows and a pride of hungry lions — it certainly seems that way. At first I wasn’t sure exactly why my eyes popped open. The clouds from the beginning of the rainy season had stayed close, so the night was a shroud of mist and inky darkness. I sat up and strained to see through the screen of the tent flap — the only window to the strange and wonderful world of the African wilderness. I could see nothing, though I knew there were three Maasai warriors nearby in their own tent. But it wasn’t their snores that had made the hair on my neck stand up. It was another sound, one more visceral and primitive. A sound I certainly wasn’t use to hearing at such close range. There is was again. And closer still. The canvas tent made it difficult to be sure, but these guttural roars appeared to have multiple sources. Great. Just how much protection will a tent give against a determined lion? I wasn’t sure and didn’t want to be on a BBC World Special Report the next day as a tent-wrapped lion appetizer. Goosebumps covered my body that had nothing to do with the temperature outside. Trying to decipher the night sounds in Africa is like learning a complex new language. How close was that? Could an animal be that big?Â The background noise was hard to distinguish at first. Bells jangling discordantly. Almost frantically in fact. Bells in Africa? Where had I heard those before? Then I remembered. The cows the Maasai brought to and from their village every day. Eac h cow had a bell around its neck and now in the middle of the night those bells were in full frenzy. These cattle were very nervous. By this time I was soaked in sweat under my blankets. Can the lions smell me? If fear had a smell I’m sure it would be wafting out of our tent like garlic in a pizza kitchen. I was afraid to breathe for fear it would give away our position. Looking over at my tent-mate, I saw that she too was awake and her wide-eyed look mirrored my own.Â “Lions?” she whispered. I nodded in the dark. We’d just left a ten-week volunteer expedition on the Venetia and Karongwe Animal Reserves in South Africa, so the sound of roaring lions at night wasn’t unfamiliar. But never this close! At dinner — now what seemed a lifetime ago — our Maasai guide, Daniel, had told us a little about the customs of his tribe. One story in particular I remembered right about now was the traditional rite of passage to manhood which included killing a lion. At the age of fifteen, the boys of the village are circumcised and then sent out as a group into the bush. They are allowed to carry only a spear and a knife and must stalk and slay the creature before they can return. When the lion is killed, it is skinned and the skin is kept in the village as a symbol of the bravery of the Maasai warrior. The canine teeth are put on a string for the boy who did the killing to wear as a badge of honor. 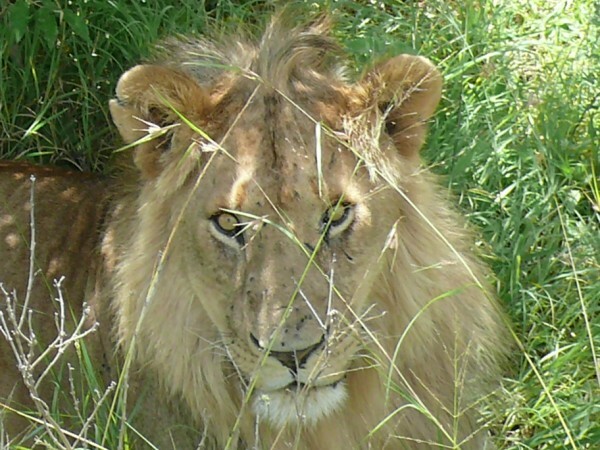 Perhaps these lions just outside of our tent were on a mission for revenge. Maybe it was the Simba of their pride whose pelt now hung in the Hut of Honor. 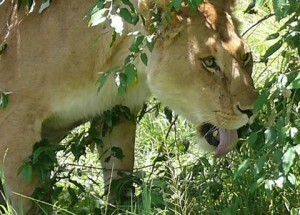 Lions are very intelligent. Could it be possible that these fellas were looking for a little payback? Bringing back the red tunic of a Maasai warrior to the lion’s den could be a symbol of honor for them as well. And here we were camping right in the middle of them. It’s never been a tradition in my family to slay a lion for honor, but these cats couldn’t know that. I was also worried about the children we’d spent the afternoon playing and singing with in the village. Happy, gap-toothed smiles, noses running and faces covered with flies, these children could not have been more beautiful. Posing gently, arms around each other, making sure the smallest of them was seen by the camera. Then the huge crowd around to hug my knees and giggle wildly as they saw pictures of themselves on the screen. Were the little ones safe? The Maasai village was surrounded by thorny acacia branches for protection. A large ring of thorns surrounded the dung and straw huts with a smaller ring built inside where the cattle were put every night for safety. It didn’t seem like a great deal of defense, especially against a pride of hungry, four hundred pound felines. It wouldn’t be difficult for a lion to sneak inside (there were no proper doors or gates), grab a child and be gone before anyone was the wiser. Pitch-black nights in the African bush allow all sorts of thoughts to bounce around the brain. The hours seemed to lengthen and we felt the sounds of the lions all around us. My eyes ached to see through the gloom and mist. Even though my bladder was close to bursting, going out of the tent wasn’t even an option to consider. Thankfully, as it always does, the long night melded into the first signs of dawn. As the shadows gradually developed into concrete shapes, the morning light was as welcome as coffee on Christmas morning. New sounds began to replace those which had inspired so much dread during the night hours — the mumblings of sleepy young Maasai men as they awoke in their tent, the rattling of pots and pans as our guide started preparing breakfast, birds out for the first taste of the new day, and even the cattle bells from the village seemed to calm as the morning sun rose higher. Cautiously, we poked our heads out of the tent. “Is it safe?” I asked before bolting to the outhouse. Some things just can’t wait, lions or not. Spending a few nights with the Maasai was an incredible privilege, lions or not. Observing a way of life that hasn’t changed very much through the centuries gives new perspective to our own everyday difficulties. The Maasai are a proud people willing to share what they have and asking nothing in return. I felt the gifts of their stories and smiles to be a priceless addition to the trove of treasures we’ve accumulated on this journey around the world. Lisa and her traveling companion Cheryl MacDonald are the authors of “What Boundaries? Live Your Dream!”. They travel the world, writing and photographing their adventures to inspire others to live their own dreams. Follow their blog at What Boundaries Travel.